A new toolkit designed to help acute hospitals learn from retrospective mortality reviews is being launched today (Thursday 7 June). The toolkit is the result of a collaboration between the Royal College of Physicians and two Academic Health Science Networks (AHSNs) – Yorkshire & Humber and West of England. It is aimed at supporting organisations in standardising mortality reviews and translating their findings into quality improvement initiatives by using a methodology called the Structured Judgement Review (SJR). This method was developed and validated by Professor Allen Hutchinson from the Yorkshire & Humber AHSN’s Improvement Academy and allows trusts to learn about both the good and not-so-good care in their health processes. The toolkit brings together learnings from the National Mortality Case Record Review (NMCRR) and the Yorkshire and Humber mortality programme. The NMCRR programme aims to improve understanding and learning about problems and processes in healthcare and to share best practice. It helps healthcare professionals to identify themes and address deficiencies in processes and patient care. Members of the West of England Patient Safety Collaborative, coordinated by the West of England AHSN, adopted a partnership approach to implementation of the Structured Judgement Review methodology. This Collaborative includes acute trusts, mental health providers, primary care and public contributors. 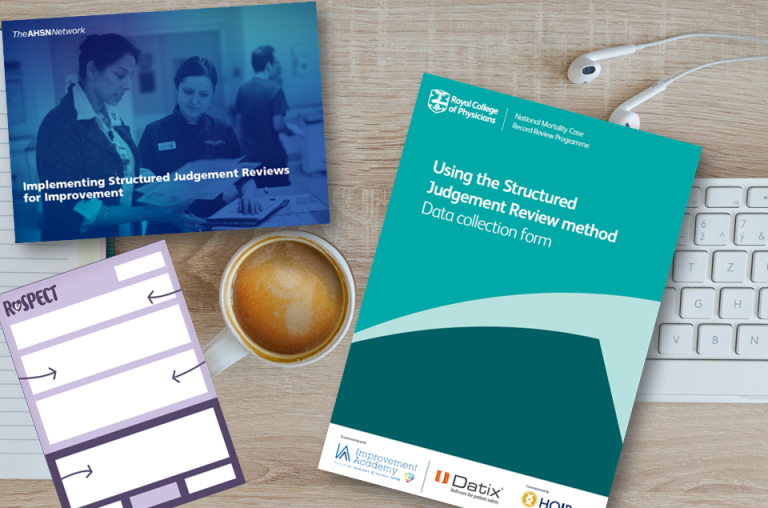 This toolkit captures the experience and learning of the Collaborative in implementing the Structured Judgement Review in the hope it will inform and support others. One of the themes that emerged from reviews in the West of England was the opportunity to improve end of life care by standardising our approach. Today (7 June) the West of England AHSN is bringing together clinicians, families and commissioners to look at how we can adopt and spread the ReSPECT (Recommended Summary Plan for Emergency Care) process across the West of England. Delegates will explore building on the approach we took to our award winning NEWS Programme.